French Emblems: Emblem: Veritas tempore revelatur, dissidio obruitur. Veritas tempore revelatur, dissidio obruitur. Truth is uncovered by time, but is buried by discord. Quid penniger Saturne in auras virginem nudam rapis? Quid feminarum coetus aggesta obruit terra scrobem? Obruere pestis apparat; Lis, Invidia, Calumnia. Winged Saturn, why are you carrying a naked maiden off through the air? Why is that crowd of women burying her in a grave of heaped-up earth? - It is shining truth, the daughter of time, whom a threefold plague is burying in a cavernous tomb: Discord, Envy, Slander. Metrum est Iambicum tetrametrum monolon [=monocolon] . unde sumpta est fingendi Emblematis occasio. The metre is an Iambic tetrameter monocolon. The saying of the old poet, that Truth is the daughter of Time, is on everyone’s lips, because time does indeed bring forth the truth; and the figure of Saturn can unquestionably be understood [as a substitute] for Time. Now it is definitely agreed that Democritus said that truth once lay submerged and buried at the bottom of the deepest of wells: which is the starting-point for inventing this Emblem. 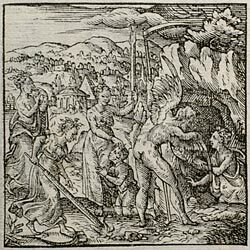 Truth should be portrayed as a naked maiden, emerging out of a dark cave, visible between the rocks from her navel up, being led out by the right hand by Saturn, who flies hither and thither in the air on balanced wings. Around about them stand three afflictions in female form, Discord, Slander and Envy, who, furnished and armed with spades, are attempting with hands and feet to bury Truth under the heaped-up earth. Now let me give the appearance and dress of each of these characters one by one. Truth is depicted as a maiden, snow-white and honest-looking, and without wrinkles, dressed in a mantle, with a pure light shining from her eyes. Slander, Lucian tells us, was once portrayed by Apelles, the prince of painters, so as to be beautifully dressed, of surpassing beauty and blazing countenance, [p.145] carrying a burning torch in her left hand, while with her right she drags along a growing lad (depicted in a position of supplication) by his hair. Envy, meanwhile, should be portrayed as a figure of ghastly poverty, with a squinting countenance, with a crown of writhing vipers about her head, and offering a human heart to her mouth to feed on. I will give a description of Discord, or Strife, in Emblem LIIII ([FJUb054]). Saturn, for his part, should be depicted bare-headed, in the likeness of an old man, with wings, holding a scythe in his left hand or (as others would have it, an hour-glass). The rest of the picture follows from the above. 1. Preserved for posterity by Aulus Gellius, who failed however to record the name of the poet.